In recent years, bamboo has emerged as an environmentally friendly type of wood used for a number of different applications. From sunglasses to architecture to baseball bats, bamboo is sprouting up everywhere these days, and with good reason. There are several traits exhibited by bamboo, a species of grass often mistaken for a tree, that make it a perfect eco-friendly alternative to other woods. Bamboo stalks take only about five to seven years to mature, as opposed to large trees that can take between 30 and 60 years. 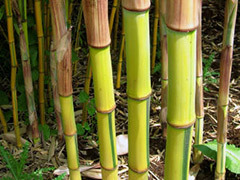 In addition, bamboo is self-regenerating, meaning that after it is cut, the remaining root will regrow another stalk. And it will do it quickly: bamboo can grow as rapidly as three to four feet per day, depending on the species. Aside from its unique ability to grow fast and replenish itself, bamboo is kind to its surrounding environment. Unlike cotton, which requires so much spraying that it often destroys valuable nutrients in the surrounding soil, bamboo requires no fertilizer or pesticides. Additionally, its intricate root system, which stays intact after harvesting, helps prevent soil erosion and can often regulate the quality and quantity of water flowing through the area. As if those benefits weren’t enough, bamboo is one of the best plants at capturing and trapping CO2. A particular Mexican species of bamboo called Guaduaangustifolia has the ability to capture 149.9 tons of CO2 per every 10,000 square meters of space over the course of seven years—an enormous amount compared to other plants. Bamboo also has a tensile strength greater than steel, meaning architecture has begun to employ it as an eco-friendly alternative to other tough materials. For all of the reasons cited above and many more, bamboo has distinguished itself at the turn of the 21st Century as one of the most environmentally-friendly materials around. With timber production proving more costly and detrimental our surroundings, the use of bamboo simply makes sense. Posted on December 25th under Global Ecology.